Mario Machado was an eight-time Emmy-winning television and radio broadcaster. He made television history when, in 1970, he became the first Chinese-American on-air television news reporter and anchor in the nation. In fact, he was also Portuguese. 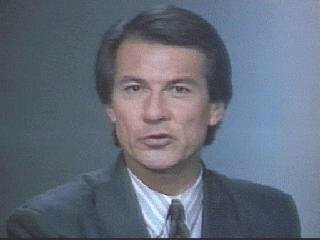 <—MARIO MACHADO began his career in 1967, when he landed at KHJ-TV (now KCAL-TV) as a news reporter. The next year, he was promoted to color commentator at the Southern California CBS affilliate KNXT (now KCBS-TV). In 1969, Machado became the initial consumer affairs reporter in the nation at KNXT. Mario became a regular reporter in 1970 on The Big News, the most popular nightly newscast in Los Angeles. He worked with the very popular Jerry Dunphy. When not hosting talk shows or anchoring the news, Mario was also cast as a news anchor, reporter, or himself on popular television shows. In cinema, Machado often portrayed a news anchor or a reporter; notably in the RoboCop series of movies, Brian’s Song, Oh, God!, The Concorde … Airport ’79, Rocky III, St. Elmo’s Fire, and Scarface. He also appeared as himself in Blue Thunder. Mario’s distinctive voice can be heard on films for Retinitis Pigmentosa International’s TheatreVision, which provides blind audiences with a description of what is happening on the screen. Mario served as the English language commentator at a number of FIFA World Cup soccer championships. In 1986, he became the commissioner of the American Soccer League. For a decade, Machado published Soccer Corner Magazine, for fellow enthusiasts of the sport. During my initial year as a radio disc jockey at 11-10 KRLA, I met the affable news icon, and Mario stressed the importance of being a positive role model for Latino youths in our community. I considered his 1981 advice to be valuable and generous. This entry was posted on Monday, May 6th, 2013 at 1:06 am	and is filed under Blog by Manny Pacheco. You can follow any comments to this post through the RSS 2.0 feed. Responses are currently closed, but you can trackback from your own site.